Alas, season 11 of Treehouse Masters has drawn to a close. But my oh my, did we end on a high note! 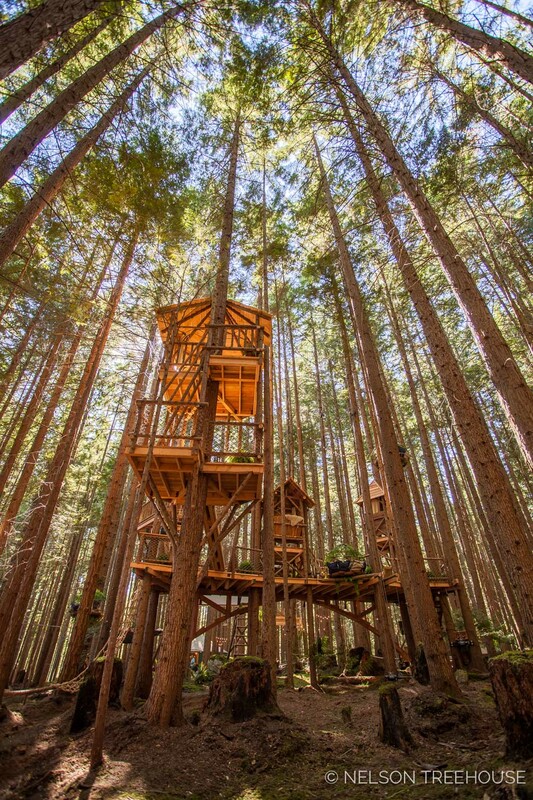 For this season finale, we created something especially unique and playful… enter our open-air, multi-pod movie theater in the trees. This project was a real standout for us: for one, it was a joy to partner with our friend Scott to build in his lush, Pacific Northwest backyard. The treehouse was also unique because we built it organically onsite, meaning without prefabrication. Organic builds are always especially creative and fun for our carpentry crew, as it opens the door to greater experimentation onsite. 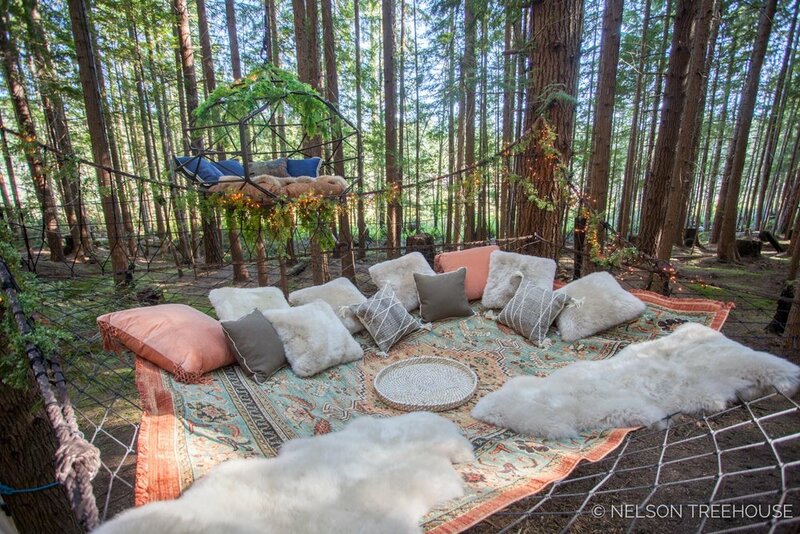 Our Emerald Forest Theater consists of four “box seat” open-air pods, a 30-foot-long bridge, three “Kodama Zome” hanging loungers on mechanized pulley systems, one hammock-like “dream net”, a projector platform, and a screen strung between soaring trees. 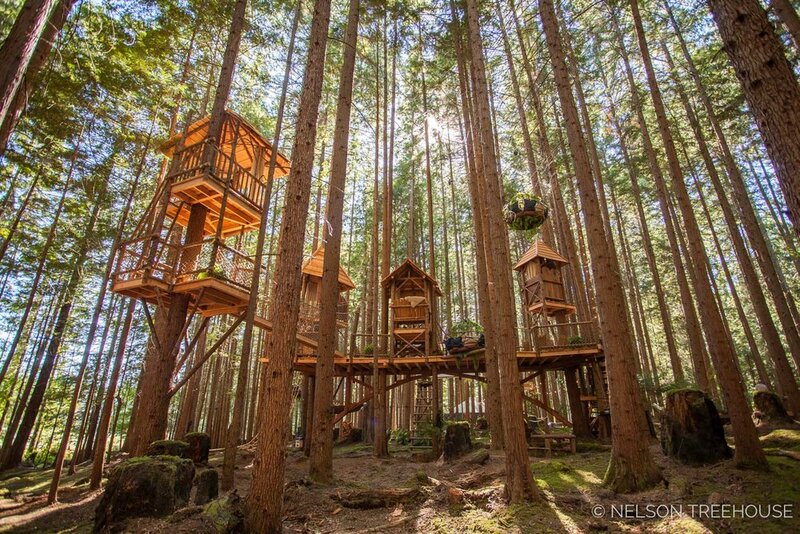 The treehouse roosts in a grove of hemlocks, cedars, and Douglas firs. The treehouse was a truly collaborative effort. 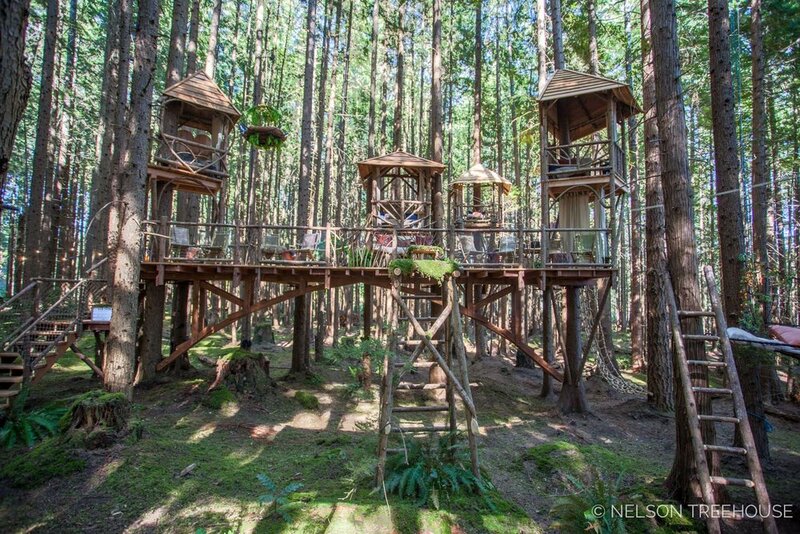 “The coolest part for me was that each component of the treehouse was built by different crew members, and that you could associate the style of craftsmanship with the people who made it,” says Rolf Hefti, Nelson Treehouse carpenter extraordinaire. 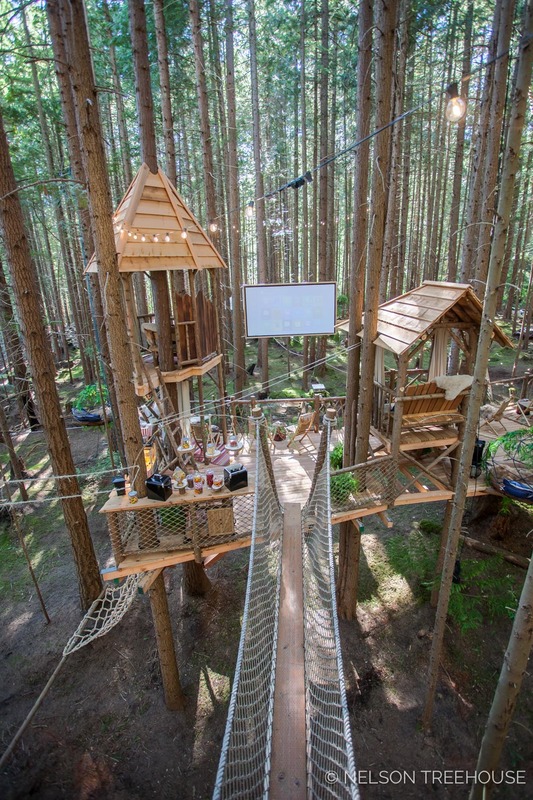 Each corner of the treehouse contains a playful feature. 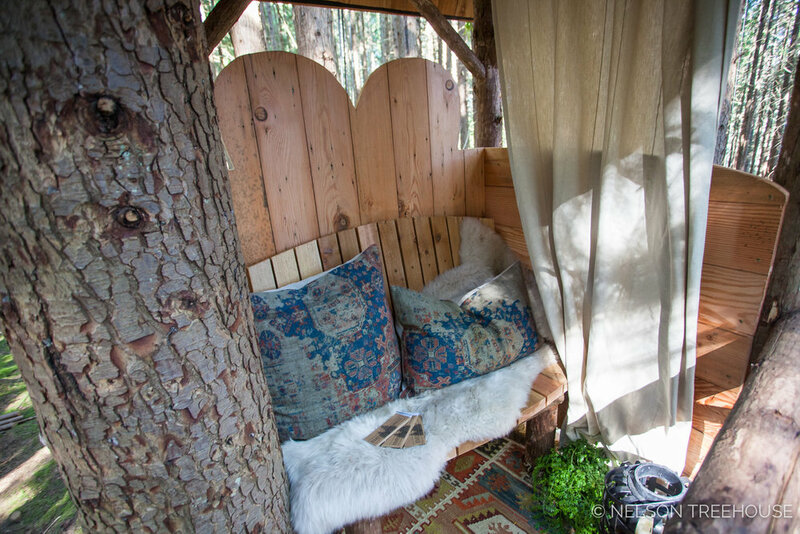 Our friend and past collaborator Sarah Jay wove this opulent dream net between six trees. The hanging lounger behind the net is from Kodama Zomes and is rigged up on a mechanized pulley system. Movie-goers can enter the Zome from the dream net and then ride up into the trees! 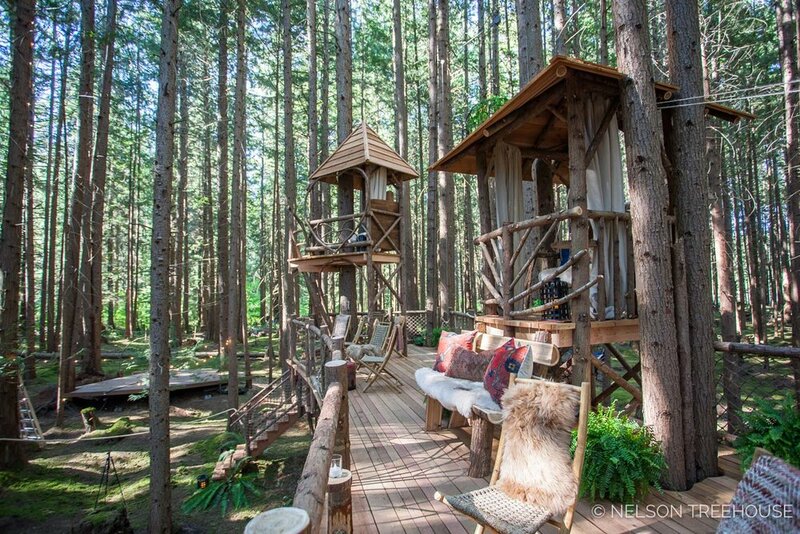 Pete knew he wanted to create a long, arched bridge for this treehouse. The only problem was the logistical constraints on the materials we could bring to site: the treehouse is only accessible via a half-mile single-track trail or a series of ziplines over a nearby marsh. Everything—including tools, lumber, and snacks—had to be carried in on wheelbarrows or flown over on ziplines. The crew collected branches locally for use in the treehouse. The first box seat includes a privacy screen for mid-movie smooching. Interior designer Christina Salway knocked it out of the park with soft and cozy furnishings. Henry Nelson cut the mountain silhouette on this pod. 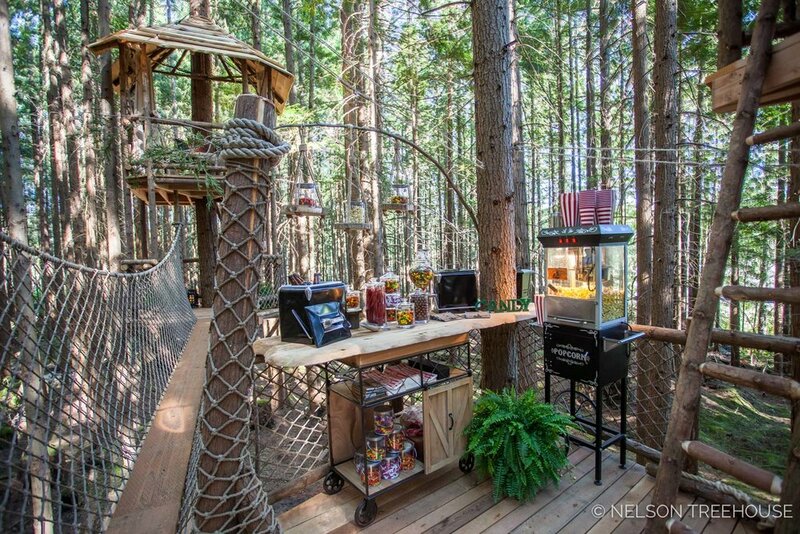 A snack station nestles in a corner of the treehouse. What’s a movie theater without popcorn, after all? The platform for the fourth pod soars 20 feet off the forest floor. This project gave our crew the opportunity to play, creating something that they would have loved as kids, only with grown-up features and exquisite craftsmanship. 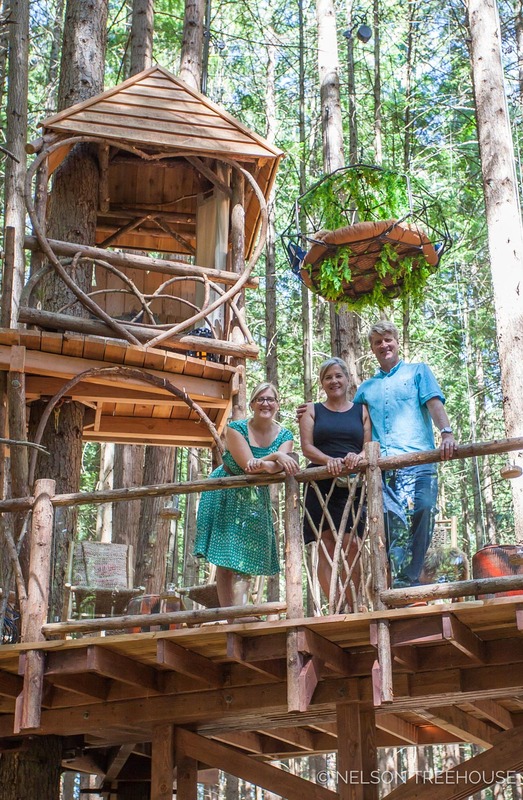 You can revisit treehouses from every episode of Treehouse Masters, here.